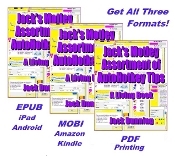 This bundle of three digital formats of Jack's Motley Assortment of AutoHotkey Tips comes with the EPUB format (iPad, Nook, Kobo, etc. ), the MOBI format (Amazon Kindle) and the Adobe PDF format for printing on letter size paper and putting in a notebook for easy review and notetaking when away from your computer or other reading device. Absolutely the Best Free Windows Utility Software Ever! Create Power Tools for Windows XP, Windows Vista, Windows 7, Windows 8 and Windows 10. This first edition of Jack's Motley Assortment of AutoHotkey Tips includes more than 80 chapters of AutoHotkey tips, tricks, and techniques. But, that only reflects the starting point for this Living Book. Every six months to a year, I will add 30 or more new chapters based upon my current explorations of AutoHotkey. If you own this book, you will get all of these new editions free. You only need to buy this book once. If you're new to the AutoHotkey Library you can either purchase the Motley Plus Mega Bundle which includes all nine of Jack's other AutoHotkey books, plus, Jack's Motley Assortment of AutoHotkey Tips.